The Sisters Brothers [Book Review] – my books. my life. Eli and Charlie Sisters have been hired to kill Hermann Warm. But first, they must travel, 1850s-frontier-style, from their home in Oregon to San Francisco and find him. Along the way, they encounter some interesting characters and have to fight (and shoot) their way out of a variety of sticky situations. Once in San Francisco, they find their task a bit more complicated than originally thought. 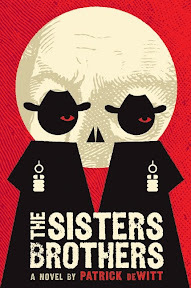 The Sisters Brothers is one of those books that I enjoyed while I was reading it but I am at a loss to explain why now. It really just didn’t stay with me after I put it down. I liked Eli as a narrator because he was complex; sympathetic but still a killer. The story would have been much different told from Charlie’s perspective, who acts more like the wild west hired gun he is. The juxtaposition of the two brothers’ personalities is what makes the story interesting. I’m not sure I liked the ending and maybe that’s why the story didn’t stick with me. It sort of changes everything and I think their circumstance was supposed to be a bit comical by then but I was rooting for some other ending. I need to thank Cassandra from Indie Reader Houston and Jennifer from Literate Housewife for even getting this book on my TBR. We were chatting about the Tournament of Books and how none of us had read many of the contenders (or any in my case) and we decided to read one together. Jennifer and Cassandra suggested The Sisters Brothers and even though it sounded nothing like a book I would pick on my own – or maybe because of that – I decided to give it a go. And I really did enjoy the book when I was reading it so I’m glad for the push to go outside my comfort zone. I suppose I would say this is worth reading even though I can’t tell you why and I am curious to see how it does in the Tournament. I’ve seen this in the library so might pick it up. I bought this one when the Borders close by was going out of business, and I haven’t had the chance to read it yet. I do really think the premise sounds interesting, and I have heard a lot of bloggers mention that it’s really funny too. I am hoping to get to it soon, as I want to be ready for The Tournament of Books. This was a great review, but I am sorry to hear that the book didn’t stick with you! I also liked Eli’s complex character, but although I could tell it was SUPPOSED to be comic, that really just didn’t come across for me at all. I still think it might make it through the first round in the TOB, it seems like a better fit for Wil Wheaton than State of Wonder, but I’d be surprised if it makes it much farther, personally.